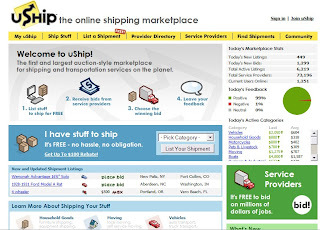 Uship is an interesting internet service that offers an online platform for shipping service (shipper and shipping provider). It is not like post office or other delivery services such as UPS or Fedex, the Uship is good for big or over-sized goods such as piano, motorcycle, etc or something that won’t be accepted by standard package carriers. People (shippers) can post shipping stuff on Uship, and shipping providers can bid, customer can pick a winner. After all done, customer post feedback on Uship. It is good for shippers and shipping providers. So if you need move some big stuff or moving shipping, you have more choices now.